On April 4, FutureHeights will host a community meeting to share plans that are taking shape for the Noble Road commercial corridor, and gather community input. At the meeting, which will take place at 7 p.m. at McGregor Home, 14900 Private Drive in East Cleveland, the project consultants—Camiros LTD and The Riddle Company—will present their research and ideas to the community. Noble Road is the most significant street in the northeast section of Cleveland Heights, giving its name to an area known as the “Noble Neighborhood.” FutureHeights, in cooperation with several community partners, kicked off a planning study of Noble Road in fall 2018. FutureHeights is proud to launch the fifth round of its Neighborhood Leadership Workshop Series, a multidisciplinary leadership development program. Participants will develop leadership skills and gain knowledge and tools they can use to help make their Cleveland Heights neighborhood strong, safe and vibrant. Since 2015, 47 Cleveland Heights residents have completed the workshops. Participants were interested in learning more about Cleveland Heights and meeting other civically minded people, and some had a community or neighborhood project in mind when they signed up. Many workshop series graduates have gone on to receive project funding through the FutureHeights Neighborhood Mini-Grant Program. On Oct. 29 and 30, consultants from Camiros, Ltd., a nationally recognized urban planning firm, and The Riddle Company, a real estate and economic development marketing consulting practice, made their first visit to Cleveland Heights to begin a planning study of the Noble Road corridor. FutureHeights commissioned the study with the goals of revitalizing the corridor to enhance the neighborhood’s image and improve residents’ quality of life. During the two days, the consultants toured the Noble neighborhood and the city of Cleveland Heights, and met individually and in small groups with almost 40 residents and business owners. They also met with members of organizations such as Noble Neighbors, Home Repair Resource Center, Central Bible Baptist Church, Noble Neighborhood Library, and the cities of Cleveland Heights and East Cleveland. FutureHeights completed the fall 2018 round of its Neighborhood Mini-Grants Program, approving $1,425 in grants to support four neighborhood projects in Cleveland Heights. The grants are intended to spur small, grassroots projects to improve quality of life and build community. The Old Vaudevillian was awarded $355 for its costume exchange pop-up project, located in the former Heights Music Shop space, and its plans to build community, provide low-cost Halloween costumes to children, and decorate and re-use a vacant storefront. GardenWalk of Cleveland Heights received $250 for its garden walk project. GardenWalk is a free, self-guided tour of private and community gardens and home orchards in each neighborhood in the city. GardenWalk aims to nurture community, beautify neighborhoods and encourage civic pride. FutureHeights will kick off a planning study of the Noble Road commercial corridor on Oct. 29. The nonprofit community development corporation plans to work in collaboration with Noble Neighbors, the cities of Cleveland Heights and East Cleveland, Northeast Ohio Alliance for Hope (NOAH), residents, business owners and other stakeholders to study the area and develop a market analysis and revitalization plan. Throughout the approximately nine-month process, FutureHeights will seek input from neighborhood residents and other stakeholders. Noble Road is the most significant street in the northeast section of Cleveland Heights and lends its name to the Noble neighborhood. The study area begins at Mayfield Road and extends along Noble Road several blocks to the west of Cleveland Heights into the city of East Cleveland. After nearly 19 years of service, Kaye Lowe, the Cedar Fairmount Special Improvement District's executive director, will retire at the end of December. The SID's board of trustees is currently searching for Lowe's replacement. The position is for a part-time, 1099 independent contractor. Qualified candidates must possess a minimum of five years of experience, a bachelor's degree, excellent communication skills and strong project management skills. The non-profit serves to promote and improve the Cedar Fairmount neighborhood for its businesses and property owners. Religious teachings, and plain old humanity, suggest that there is a moral imperative to treat the stranger well. In fact, the Torah instructs Jews 36 times that strangers should be treated with compassion and dignity. At the present time, one could easily substitute “refugee” for “stranger,” and then quickly realize that many people are not living up to the religious principals they espouse. The mini-park at Roanoke and Noble roads will be the site of the market, which will run Aug. 25, Sept. 1 and Sept. 8, from 10 a.m. to noon. The mini-park, a reclaimed parcel one block north of Monticello Boulevard, was formerly occupied by a gas station. FutureHeights invites residents and others to a free public forum, “Placemaking: How to Create a Front Porch Culture,” on Tuesday, July 17, 7–8:30 p.m., at the BottleHouse Brewing Company, 2050 Lee Road. The forum will consider: In what creative and non-traditional ways are neighbors connecting and building resilience? How can the community build on its assets, including its diversity and civic-mindedness, to make it a more desirable place to live? Are you an artist, craftsperson, entrepreneur or collector? The Noble Flea wants you as a vendor for the May 19 Noble Flea Market. The event is sponsored by The Central Bible Baptist Church, FutureHeights and The Old Vaudevillian as part of the “We are Noble” community celebration. Help bring life to the vacant lot of the former McDonald’s on Noble Road. Each 10’ x 10’ space is free to vendors, but spaces are limited. We Are Noble, the annual celebration of the neighborhoods along Noble Road, will take place Friday through Sunday, May 18–20. Preparations are underway for Noble Elementary School’s NobleFest, a family fun night hosted by the Noble PTA on Friday evening, and nearby Noble Road Presbyterian Church will host a movie night on the same evening. Oxford Elementary School will participate with attractions that include a new art installation by its fifth-graders near the school’s main driveway entrance on Quilliams Road. Peace Lutheran Church, 3740 Mayfield Road, will host several activities in support of Noble Neighbors’ We Are Noble weekend in mid-May. On Saturday, May 19, from 11 a.m. to 1 p.m., guests will be welcome at a cookout lunch in the church’s front yard. The light lunch will be free and open to anyone participating in the weekend events throughout the community. At the same time, the congregation will open its "baby shop" to young families. They will be invited to choose free clothing items for their children up to size 6X. The baby shop is also open every Tuesday morning from 10 a.m. to noon, but more clothing will be made available on this special Saturday. On Sunday, May 20, following its 10 a.m. worship service, the congregation will host the annual Oxford Elementary Art Show in its upper lounge. FutureHeights completed the spring 2018 round of its Neighborhood Mini-Grants Program, approving $3,577 in grants to support five neighborhood projects in Cleveland Heights. To date, the community development corporation has awarded 23 grants—a total of $14,961. The grants are intended to spur small, grassroots projects to improve quality of life and build community. FutureHeights invites Heights residents to share their ideas about how to make the Cedar Lee Mini-Park—which many people walk through on their way from the parking lot just east of Lee Road—into a special place. FutureHeights will host a visioning workshop on Saturday, June 2, 9:30 a.m. to 12:30 p.m., at CLE Urban Winery, 2908 and 2180 Lee Road. Situated near Cleveland Heights’ newly renovated high school, the exceptional restaurants, bars and shops in the Cedar Lee Business District, and the Cedar Lee Theatre, the mini-park gets significant foot traffic. The community-development group FutureHeights and other stakeholders believe that the site has the potential to be much more than just a pass through. It could become a place where residents and visitors gather, converse and spend time. Through careful design, it could become as unique a place as the district itself, and positively impact its surrounding businesses and neighborhood. Coinciding with Fair Housing Month, FutureHeights invites residents to attend a free public forum, Choosing to Make the Heights Home, on Tuesday, April 24, 7–8:30 p.m., at The BottleHouse Brewing Company, 2050 Lee Road. Speakers will include experts on current housing trends, as well as residents who have recently purchased homes in Cleveland Heights. The panel will lead an open and candid discussion about the decision-making process of buying a home. Earth Day has been around for almost 50 years. (The scary part is that many of us remember that first Earth Day. We were young. We were excited. We thought that we would change the world. We wore funny clothes.) While one’s impact on the world may have some limitations, the impact is far greater when one works locally. This Earth Day, Sunday, April 22, Beth El – The Heights Synagogue (BE-THS) invites you to participate in the celebration by cleaning up the Boulevard neighborhood, of which BE-THS is part. Can concentrations of pocket gardens help rejuvenate neighborhoods? That’s the question a coalition of Cleveland Heights partners is trying to answer. They are working with neighbors on Langton Road, just off Quilliams Road in the Noble neighborhood, to install 10 pocket gardens this spring. The gardens will consist of either native perennials or a tree surrounded by Russian comfrey and other plants that suppress weeds and provide extra fertility. FutureHeights offers several tools to help Cleveland Heights residents leverage their neighborhoods’ assets through its Community Capacity-Building Program, including a series of workshops for neighborhood leaders and small grants for neighborhood projects. Since 2015, FutureHeights has awarded approximately $13,000 in mini-grants toward 18 projects in the city. Residents can apply for up to $1,000 for citizen-led projects and events. In addition, 39 residents from neighborhoods across Cleveland Heights have completed the workshop series, which takes place each spring. Noble Neighbors marked its fourth anniversary with a party at the Victorian Condominiums on Jan. 2. Attendees recounted the year’s activities and accomplishments over a potluck community meal. The Triangle District, the business district bounded by Warrensville Center, Mayfield and Noble roads, was a focus of attention in 2017. A group of Noble Neighbors joined with FutureHeights to gather data about every business in the area. They surveyed and interviewed every shop-owner and gleaned their perspectives on the district. Nearby vacancies were included in the inventory. This data is being recorded into a database that will serve future planning. On Nov. 17, the U.S. Postal Service honored him at a special ceremony, presenting him with a 60-year service pin and a table clock inscribed, “Thank You for Your 60 Years of Service.” His fellow workers held a buffet lunch and reception for him. The Coventry Village neighborhood encourages everyone to shop local and get in the holiday spirit with a full day of free holiday events. The 5th annual Coventry Village Holiday Festival will take place on Saturday, Dec. 9, noon to 11 p.m.
Istagram Scavenger Hunt—win prizes from your favorite Coventry spots. FutureHeights held the fifth round of its Neighborhood Mini-Grants Program this fall, approving $1,700 in grants to support three projects in Cleveland Heights. To date, the community development corporation has awarded 18 grants for a total of $12,384. The grants are intended to spur small, grassroots projects to improve quality of life and build community. Bikur Cholim of Cleveland was awarded $325 for its Hannukah – Light Menorah Party project. The organization is hosting the event in Cleveland Heights to bring special-needs children and their families together in celebration of Hannukah, and help create a strong support system within the community. Fifth-graders from Fairfax and Boulevard elementary schools helped beautify the Cedar Lee Business District this fall when they painted a mural on a blank wall at the vacant lot at Lee Road and Meadowbrook Boulevard. The students first learned about the architectural styles prevalent in Cleveland Heights, and then made their way to the wall, which had been painted a pale-blue, creating a canvas upon which they painted their images for the public. The fifth-graders were assisted by the Heights High Art Club's Londyn Crenshaw and Mila Zelic, who designed parts of the mural and spent many hours before and after school working on it. Noble Neighbors will host two candidate forums for the upcoming local elections. On Tuesday, Oct. 3, Cleveland Heights City Council candidates will have an opportunity to offer their perspectives on the Noble neighborhood and other topics. On Tuesday, Oct. 10, Cleveland Heights-University Heights Board of Education candidates and Cleveland Heights Municipal Judge candidates will have an opportunity to address the community. Cedar Taylor Development Association (CTDA) commissioned artist Thomas Conger to install a mural in the Cedar Taylor Business District. Conger completed the mural, on the west façade of the building at the southwest corner of Cedar and Taylor roads, on July 2. CTDA, a grassroots group of property owners, merchants and residents with the common goal of beautifying and enhancing the neighborhood, selected Conger in fall 2016 from among those who responded to its call for artists. 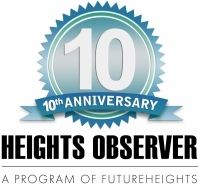 FutureHeights offers small grants of up to $1,000 to residents of Cleveland Heights, to help fund projects that improve the quality of life in their community. The grants are intended to spur a wide variety of small, grassroots community projects. The next application deadline is Friday, Sept. 15, at 5 p.m.
To learn more about the application process and grant guidelines, FutureHeights invites prospective applicants to attend one of two upcoming information sessions: on Wednesday, Aug. 16, 6 p.m., or Thursday, Aug. 24, 7 p.m. Both sessions will be held at FutureHeights, 2843 Washington Blvd., Cleveland Heights. In January, the Center Mayfield building in the Noble neighborhood’s newly named Triangle District was demolished, producing a second large vacant lot on Noble Road, near Mayfield Road. This inspired some, including area residents and the neighborhood group Noble Neighbors, to consider the Triangle District in its entirety, and and to think about how it could be re-envisioned to create a cohesive, vibrant, multi-faceted gateway hub. The Triangle District encompasses Warrensville Center Road between Mayfield and Noble roads, Mayfield Road from Warrensville Center to Mayfield’s intersection with Vandemar Street and Wilmar Road, and the stretch of Noble Road—commonly known as Short Noble—between Mayfield and Kirkwood roads. Noble Neighbors is partnering with the civic engagement committee of Future Heights and the City of Cleveland Heights' economic development and planning departments to host a communitywide workshop about the district’s future on Sunday, July 9, 3–6 p.m., at Disciples Christian Church, 3663 Mayfield Road. Noble Neighbors will host its third annual community celebration weekend, We Are Noble, Friday through Sunday, May 19–21. The repaving of Noble Road, now underway, won’t deter the celebration, according to organizers, who are planning to "make lemonade out of the traffic-barrel lemons" by using humorous public art installations to guide visitors through the neighborhood. FutureHeights held the fourth round of its Neighborhood Mini-Grants Program this spring, approving $2,700 in grants to support four projects in Cleveland Heights. The grants are intended to spur small, grassroots projects to improve quality of life and build community. Young Entrepreneurs was awarded $400 for its Lego Robotics Pilot Program. The goal of the pilot is to create a community program in which students will use Lego robotics kits, with the guidance of the Young Entrepreneurs leaders, to strengthen their critical-thinking and problem-solving skills. Young Entrepreneurs hopes to build relationships and community through the program. The Cleveland Soup and Bread Experiment was awarded $400 for its monthly potluck program. The Cleveland Soup and Bread Experiment is led by a group of Cleveland Heights residents who are interested in connecting with neighbors through a shared meal of soup, which binds people together, and working toward alleviating hunger. Heights Observer’s Volunteer Match column lists opportunities for residents to lend their time and talent to worthy organizations and causes around the Heights. Submit your organization’s volunteer needs by e-mailing Sruti Basu at sbasu@futureheights.org or calling the FutureHeights office at 216-320-1423. Carol Roe, a neighborhood resident, began her term on CH City Council in January 2016, bringing representation for the neighborhood to City Hall. Noble Neighbors asked RTA to assess the 41 bus route on Noble Road, and it was determined that ridership on the route—the only line to offer 24-hour service in Cleveland Heights—justified an additional bus shelter, which was installed in late spring. Vandemar Street residents successfully organized in opposition to the rezoning of two residential properties to accommodate a large convenience store and 16-pump gas station. Noble Neighbors distributed flyers in a neighborhood ward urging residents to deny a bar permission to sell alcohol on Sunday, and permission was voted down. The organization also participated in the Cleveland Heights master planning process, volunteered at schools and attended every city council meeting. This holiday season, FutureHeights partnered with art classes at Heights High and local property owner Jonathan Forman to decorate a vacant storefront in the Cedar Lee Business District. Students added holiday-themed scenes to the window of Forman's building at 2169 Lee Road. "FutureHeights had partnered with several property owners and arts organizations to fill vacant storefronts with art and increase the vibrancy of the district during Heights Music Hop," said Deanna Bremer Fisher, executive director of FutureHeights. "This initiative seeks to do the same during the busy holiday shopping season." Noble Neighbors invites residents to Light Up Noble! Noble area residents, businesses and institutions will be lighting up the neighborhood this holiday season. Light Up Noble! is the newest Noble Neighbors initiative to showcase the neighborhoods along Noble Road. Thousands of visitors come to the neighborhood each year to view the holiday lighting display that GE Lighting designs and installs at its Nela Park campus in East Cleveland, just north of the Cleveland Heights city line. This year will be the 92nd year that the company will create the display. It will be the first year that Noble Neighbors seeks to expand the holiday lighting spirit to the rest of the neighborhood. 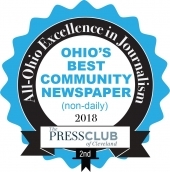 “This year, Noble Road from Monticello Boulevard to Euclid Avenue will become a glowing, welcoming corridor, twinkling with community pride,” said Susan Sanders, one of the leaders of Noble Neighbors. The lights will reflect the area’s diversity—featuring holiday-themed decorations, solstice observance illuminations, and displays showing pride in Cleveland sports teams. The common goal is for neighbors to join together to display neighborhood pride to all who visit the famed Nela Park lighting display. FutureHeights awarded the third round of its Neighborhood Mini-Grants Program this fall, approving $2,840 in grants to support five projects in Cleveland Heights. Grants are intended to spur small, grassroots projects to improve quality of life and build community. Forest Hills Homeowners Association, $250 for its Forest Hills Historical Signage Beautification Program. Oxford Community Garden, $480 for its Garden Shed Repair project. Fairfax Community Garden, $500 for its Community Garden Upgrade project. Urban Oak School, $610 for its Cleveland Heights P.E.A.C.E. Park Garden project. The Welcome Hub, $1,000 for its Driver’s Education Scholarships for Refugees project. Block parties have long been a way for neighbors to connect with one another over food and conversation—and what kid doesn’t love a chance to play or ride a bike in the street without getting yelled at? In late August, Edgerton Road neighbors between Washington Boulevard and Silsby Road in University Heights convened a block party and, in doing so, took this traditional form of community engagement to a new level, drawing adults, kids and guests from not only that stretch of Edgerton, but also from surrounding blocks. “We’ve always had an inclusive approach,” said Jackie Gould, the driving force behind the Edgerton block party since it became a regular event in the early 2000s. “If one of the residents on Edgerton wanted to invite someone from one of the nearby streets, they were welcome to do so.” Traditional methods of promoting the event included flyers left in mailboxes and word-of-mouth. On Sept. 10, 30 local residents gathered at the corner of Hampshire and Cadwell roads in the Coventry Village neighborhood to dedicate the community green space known as Spirit Corner. A house built on this corner in 1898 had sat vacant for more than 50 years before it was demolished in 2012. Neighborhod residents, led by Laura Marks, asked city officials to allow them to adopt the site and make it a green space and gathering space. Neighbors named the site "Spirit Corner" in memory of the spirits that, purportedly, had inhabited the otherwise long-vacant house, known to neighborhood children as the "haunted house." On Friday, Aug. 19, Noble neighbors gathered to enjoy a summer evening on the front lawn of Bethel Church. The back-to-school celebration, organized by the Noble Neighbors group, featured Euclid Beach Rocket Car rides, an ice cream social and a chalk walk. The event brought together children and families to celebrate their neighborhood and build community, and had two primary goals: to celebrate and encourage children and teens in their educational endeavors, and to reach out to families living in apartments along Noble Road. The event successfully brought people together, with 200 frozen treats consumed, 170 Rocket Car rides enjoyed, and more than 50 sidewalk canvases created by chalk artists of all ages. Representatives from Reaching Heights and Open Doors Academy shared information about their respective educational initiatives. Participants of Developing Alternatives for Women in New Communities (DAWN) brought sewing crafts to display and sell to the community, and brought their children and families to join the celebration. Also present were members of FutureHeights, and Cleveland Heights Fire and Police departments' community engagement and canine units. Cleveland Heights Mayor Cheryl Stephens and Council Member Carol Roe also visited. FutureHeights launched its Neighborhood Mini-Grants Program last fall and has approved almost $7,000 in grants to support eight neighborhood-based projects in Cleveland Heights. Through the program, FutureHeights seeks to help Cleveland Heights neighborhoods leverage their many assets and provide tools to enable neighborhood leaders to work together on creative solutions to the challenges that face the community. RAFT Coexist was built and launched in August. The project's 12' x 8' wooden platform was created to provide a space for people to build community and be present in the moment, to coexist in nature in a harmonious and comfortable way. On Aug. 7, a new art installation will be unveiled in the Cedar Fairmount neighborhood of Cleveland Heights. RAFT: Coexist is a 12’ x 8’ semi-permanent wooden platform for rest, contemplation and community. Tiffany Laufer, a filmmaker, artist and resident of Cedar Fairmount, created RAFT together with her neighbors Kristin Hopkins, Emily Dunford Hubbard, William C. Laufer and Victoria Mills. The group envisions it as piece that will highlight a place in their neighborhood and create platform for people to rest, be present in the moment and coexist in nature harmoniously and comfortably. RAFT will debut at noon on Sunday, Aug. 7, at the corner of Bellfield Avenue, West St. James Parkway and North Park Boulevard. All are invited to visit RAFT from noon to 5 p.m., coinciding with the 15th Annual Cedar Fairmount Summer Festival taking place at the same time. The installation will remain in place throughout the fall pending inclement weather. Noble Neighbors will celebrate the return to school on Friday, Aug. 19, 5–8 p.m., at Bethel Church of Cleveland Heights, 2706 Noble Road. Children and adults are invited to display their creativity as part of the Noble Chalk Walk, which will stretch along the sidewalk from Bethel Church to the Noble Neighborhood Library. The Euclid Beach Rocket care will provide rides through the Noble neighborhood, and tasty treats will be shared. Coventry Village will celebrate all things Star Wars with its Star Wars Tribute Day on Saturday, Aug. 6. From 2–5 p.m., snap a photo with your favorite characters as they roam Coventry Village; play Star Wars video games in a free mobile truck parked in the heart of Coventry Village; and battle your friends in Lightsaber Wars, a kid-friendly battle arena. Coventry Village shops will be joining in the fun, offering Star Wars-themed specials and discounts. Cleveland Heights residents can expect to deal with torn-up sidewalks and roads for several more years, as Dominion East Ohio replaces old gas lines with newer, more durable ones. The pipeline infrastructure replacement program, launched in 2008, is a $4 billion project expected to last for 25 years. The utility will replace 5,500 miles of pipe within its 22,000-mile system. According to Alex Mannarino, the Cleveland Heights director of public works, the Dominion project started in Cleveland Heights in 2010, with work on Euclid Heights Boulevard, Taylor Road and a few other streets. Mannarino said that many of the gas lines being replaced are more than 100 years old. The Coventry Village Summer Series returns with a packed schedule of free weekly fun, including outdoor movies and yoga classes, live music, special events and community drum circles. The series kicks off on Saturday, June 4, with Free Bike Tune-Up Day in Pekar Park Courtyard, 11 a.m. to 1 p.m. Hirobel, a Cleveland Heights company producing high-performance bicycle components, will offer free bike inspections and repairs. All donations from the event will benefit the Heights Bicycle Coalition. Bring your bicycle early, as this event is first-come, first-served. The Coventry Village Sidewalk Sale and Pop-Up Pinball Party will be held on Saturday, June 25, noon to 5 p.m. Stroll through the neighborhood and enjoy great deals, as well as free-to-play pinball machines on the sidewalks. 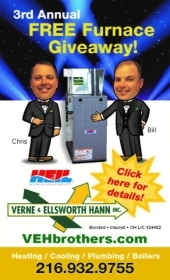 Pinball wizards from the Cleveland Pinball League will provide playing tips and award prizes. During the event, those 18 and older can step into the Coventry Cash Cube, a blowing machine filled with Coventry Cash, to be used at participating Coventry merchants on June 25. The day will also feature live music and a beer garden. The Cedar Taylor Development Association (CTDA), with the support of FutureHeights, is holding a contest to commission an art installation for the Cedar Taylor Business District. The contest is open to any and all artists. CTDA has a total of $3,000 to spend, and wants artists to propose what they want to do. Proposals could include, among other ideas, painting a mural on the side of a building, painting an abstract piece somewhere in the business district, or installing a sculpture. CTDA has no preferred medium, so creative proposals are encouraged, but it must be a permanent installation. It is up to entrants to determine what they can create for $3,000. The Center Mayfield Building may be demolished if the property owner does not find a buyer who is willing to preserve this historic building at the eastern gateway to Cleveland Heights. Circle K representatives have submitted an application to Cleveland Heights City Council to rezone two residential properties on Vandemar Street. In addition to demolishing the houses, Circle K intends to tear down the Center Mayfield Building, which includes a former movie theater and spans Mayfield Road from Vandemar to Noble roads, to build a 16-pump gas station and Circle K convenience store on the property. The footprint for this development would be significantly larger than the BP gas station and convenience store located just one block east on Mayfield Road in Cleveland Heights. Momentum characterized Noble Neighbors’ second year as a volunteer group focused on the northeast quadrant of Cleveland Heights. Students from Case Western Reserve University’s Mandel School of Applied Social Sciences conducted a survey of the neighborhood in the spring. Paired with residents of the district, several serendipitous outcomes surfaced. Both residents and students noted the neighborhood’s architectural variety and the excellent condition of most of its homes. Some students declared that they would like to move to the area when they graduated. With its schools, library, churches, playgrounds, parks and backyard play spaces, Noble was identified as a “kid-friendly” area. The report also affirmed goals that Noble Neighbors already has in motion to diversify its membership through increased participation by renters and households with school-age children. Each Wednesday for the past few months, ShopCLE, a free "shopper" publication produced by the Plain Dealer and Cleveland.com, has literally hit the streets in Cleveland Heights. It's raising ire among residents because many copies, wrapped in thin plastic bags, don't land on private property, perhaps violating the city's littering law. Residents have complained to city administrators and council members, saying the papers sit for days or weeks on streets and treelawns. Section 527.09 of the littering ordinance states: "No person shall throw or deposit any commercial or noncommercial handbill in or upon any sidewalk, street or other public property." On Nov. 2, residents Gail Larson and Carla Rautenberg complained about the haphazard distribution of ShopCLE to Cleveland Heights City Council. “If these bagged papers are not picked up and are carried into the sewers, the plastic of the bags will eventually break down and pollute Lake Erie, our drinking water,” Rautenberg said. Oct. 10 was a beautiful day to be working outside—very sunny, but cool. Energetic volunteers who came to the biannual Coventry P.E.A.C.E. Park cleanup included participants from Heights High’s swim team, Roxboro Middle School’s honor society, Heights High’s National Honor Society, AFS, Minority Students Achievement Network, and Coventry’s Ultimate Frisbee Club. Volunteers pulled weeds, spread mulch, repaired playground equipment, and raked the wood chips around it. Thanks to them, the playground is ready for winter. Volunteers worked from 9 a.m. to 3 p.m., and enjoyed lunch and snacks generously provided by Heights businesses. Zoss the Swiss Baker and Phoenix Coffee on Coventry Road provided breakfast and coffee; Tommy’s restaurant provided lunch; Guy’s Pizza sent over some pizzas, and Zagara’s Marketplace donated apples. Thomas Bier, senior fellow at Cleveland State University’s Maxine Goodman Levin College of Urban Affairs, will be the keynote speaker at the annual meeting of the Forest Hill Home Owners Association (FHHO) on Tuesday, Nov. 10. The meeting will take place at McGregor Home, 14900 Private Drive. This meeting is free and open to all residents of the Forest Hill subdivision. Doors open at 6:30 p.m.; light refreshments will be served. The meeting will be called to order at 7:15 p.m. and will include a review of FHHO business, Bier’s keynote address, and open discussion on current FHHO initiatives and future plans for Forest Hill. Boulevard Neighbors, one of Cleveland Heights’s newest community associations, invites residents to its next community meeting, Improving Safety in Our Neighborhood, on Wednesday, Nov. 4, 7 p.m., at Temple Beth El, 3246 DeSota Ave. Officer Andrew Watkins, of the Cleveland Heights Police Department’s Community Response Team, will address questions raised by members of Boulevard Neighbors in previous meetings, including providing information about the Block Watch program, and will also take questions from those in attendance. Boulevard Neighbors comprises streets around Boulevard School, from Mayfield Road to Berkeley Road (north to south), and Taylor Road on the east to Lee and Cumberland roads (east to west). On Tuesday, Oct. 6, the Noble Neighbors community organization is hosting a Meet The Candidates forum at 7 p.m., at Noble Road Presbyterian Church, 2780 Noble Road. Candidates for both Cleveland Heights City Council and CH-UH Board of Education have been invited to participate. While the forum will focus on issues that impact Cleveland Heights's Noble neighborhood, residents from all neighborhoods are welcome at the forum. The Cedar Lee Business District has been going through some challenging times over the past couple of years. More than a dozen stores and restaurants have closed. Despite that, most of the area’s merchants are optimistic about the future. “I don’t think that the closing of the retail spaces is a sign that our neighborhood is unhealthy,” said Sue Wolpert. “I think we have a very healthy and strong neighborhood.” Wolpert and her husband, Ray Lesser, own the building at 2174 Lee Road. Funny Times, a monthly paper that they publish, has its offices in the building, and Serendipity Space, which they also owned, was on the street level of the building. However, Serendipity has closed, and Wolpert and Lesser are currently looking for a new occupant for that space. All questions posed to candidates will concern issues that pertain specifically to Noble neighborhood. Audience members and residents are invited to submit questions in advance, by Sept. 17, via the Noble Neighbors website, www.nobleneighbors.com. The questions presented to the candidates will be drawn from the common themes these online questions raise, and will likely ask candidates to consider the neighborhood’s economic development, housing value support, and the plan to close Noble Elementary School. A new organization calling itself Boulevard Neighbors will present a forum for neighborhood residents on issues related to housing. The event will take place on Thursday, Sept. 17, at 7 p.m., at Beth El - the Heights Synagogue, 3246 Desota Ave. The area served by Boulevard Neighbors is bounded by Mayfield Road on the north, Cumberland Road on the west, Berkeley Road and a short stretch of Euclid Heights Boulevard on the south, and South Taylor Road on the east. FutureHeights will host a forum on the future of Severance Town Center—Reimagining Severance—on Oct. 21. The focus of the meeting will be on the future of the shopping center located within Severance Circle, but its relationship with surrounding properties and neighborhoods will also be considered. The forum will take place at 7 p.m. at the Cleveland Heights Community Center, 1 Monticello Blvd. At the event, presentations on the history of Severance and the current status of the foreclosure proceedings on the retail center will provide context for the discussion, and information regarding how other communities have rethought and, in some cases, redeveloped or partially redeveloped troubled properties like Severance will be provided. In mid-April, an artistic message suddenly appeared woven into the chain-link fence opposite the Oxford Elementary School driveway: “You Are Noble.” Our Noble communitywide home and yard sale was coming up soon and it certainly seemed that this display anticipated our April 26 event, but no one from Noble Neighbors had considered including public art in our mass communications strategy. Who knew the artists and what was their intent? The third annual Grant Deming's Forest Hill Historic District Neighborhood Garage Sale Days will take place on Saturday, July 18, and Sunday, July 19, 9 a.m. to 3 p.m.
A map of the 20-plus homes participating in the sale will be posted on July 17, at www.grantdemingneighborhood.org, and available at participating houses on July 18 and 19.